If you are in need of a suit for a particular occasion, you can pretty much guarantee the event is an important one; this means looking at your best. 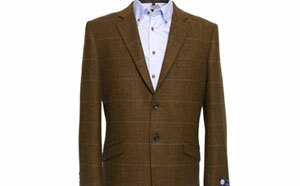 One way to look at your best in a suit with a difference is to opt for tweed. The popularity of the tweed suit is undergoing a resurgence and is fast becoming the must have suit for modern fashionable men. The fabric also still remains the most popular in highland wear and is used at many traditional Scottish weddings. The option of tweed suit hire is one that appeals to many people and gives the chance to find a suit that is perfect for a specific occasion without breaking the bank. Tweed suit hire generally comes in a plain, twill or herringbone pattern. Opting for a plain pattern in a grey or black lounge suit will be perfect for almost any occasion. The lounge suit consists of a single or double-breasted jacket and matching trousers, which can be combined with a waistcoat and choice of shirt for an excellent formal look. As a fabric, tweed is both moisture resistant and durable making it perfect for outdoor events such as garden parties; its insulating properties also make it a good choice of outfit for winter occasions. The twill patterned suit is very popular at casual events and a tweed suit jacket with wide peaked lapels is currently the must have fashion accessory. Because of the pattern, twill will not be ideally suited to formal events such as black-tie dinners and weddings. Herringbone is a zigzag pattern and one that is very popular, opting for this pattern on a grey or black suit lounge suit will have you looking the part at any sort of occasion. Tweed suit hire is a very popular choice of outfit for grooms looking for traditional highland wedding wear. Highland wedding outfits consist of a jacket which is cut just above the waist, a matching waistcoat, white or black wing collar or standard collar shirt with tie or bow tie, kilt and plaid with broach. A sporran is also commonly added to complete the classic look. The coat is an essential part of the traditional highland wedding outfit and tweed suit hire is generally the preferred option. Black or grey are the favoured options of coat in terms of colour, and the jacket will come with a choice of one or no buttons. Peaked lapels are commonly chosen along with three buttons on each sleeve. The waistcoat is also an important part and will match the jacket. Most companies offering highland tweed suit hire will provide the whole outfit along with any accessories as part of a package which will ensure you have everything needed. Many people like to find tweed suit hire that is tailored to their size; this service is provided in most hire shops but will be unavailable through online retailers. If you opt for online suit hire, it will be important to order in advance to ensure plenty of time is allowed for a replacement if necessary.